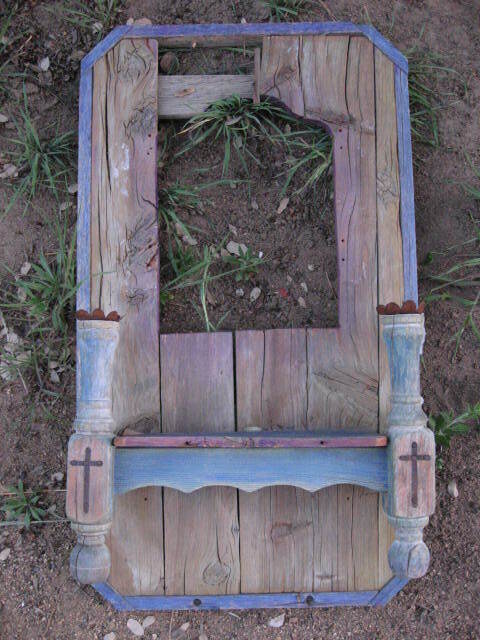 I actually think this was made by a close friend of mine and his late mother a few years ago when they were making folk art crosses, altars, and such. It needs some fixin’ up for sure, but hey, that’s what I do! I’m going to call my friend and see if he wants to I.D. this piece…but regardless, I can’t wait to mess with it a little. I wonder what this incarnation will bring? I find JOY in the craziest places! ~ by Dawn Elliott on May 12, 2011. I have found road side joy before ! The perfect table for beside my bed, after some work and creativity on my part ! Love this piece – ready for magic !!! this is treasure for sure. and so are all your friends who grace your life in so many unexpected ways! love finding treasures in trash : ) love your find! Ok – I envision building a little nicho into the opening and creating a shrine there………. much more interesting than a mirror and who better to do that than you, dear one? Oh wow! What a great find. Oh, you will revive this little piece. I already see lots of color, oh boy, it will be fun to see the end results. I can’t wait!! Yay! Can’t wait to see what you do with it, be sure to post on JOY Thursday! Oh how could anyone get rid of something like this. I’m so glad you found it before the pickup came around.